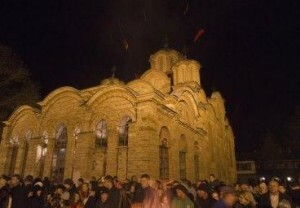 The greatest Christian holiday, Easter, was marked in all Orthodox churches in Kosovo on Sunday. In Gračanica, the celebrations of the Resurrection of Jesus began with a midnight procession around the monastery, holiday hymns and church bells. Several hundreds of believers gathered at midnight in the yard of the Gračanica monastery. The procession around the monastery building, the Matins and the liturgy were led by the Serbian Orthodox Church Bishop of Raška-Prizren Teodosije together with priests from the diocese and the sisters at the monastery. Aleksandar Vulin, outgoing head of the Serbian government’s Office for Kosovo, attended the liturgy at Gračanica on Saturday night. He urged the people in Kosovo not to abandon hope, not to abandon Serbia and not to abandon Kosovo, to stay where they were in order to face the troubles that lie ahead. A packed morning liturgy at St. Demetrius Church in the northern, Serb part of Kosovska Mitrovica was followed by a reading of an Easter message from Patriarch Irinej, who called on the faithful to remain with God and keep their hearts and souls with the people suffering in Kosovo and everywhere where the Orthodox Christians were suffering only because of their name and faith in Christ. The Orthodox believers also visited the Orthodox Church of St. Sava in the southern, Albanian part of Kosovska Mitrovica. They were accompanied by the Kosovo police and the visit finished without any incidents. Easter was also celebrated with a holy liturgy at the Cathedral Church of St. George and the Monastery of the Holy Archangels in Prizren. Orthodox churches in all Serb towns across Kosovsko Pomoravlje District were filled with people attending Easter liturgies.